Disciple of Onoe Tamizô II. He died the 11th of August 1873. 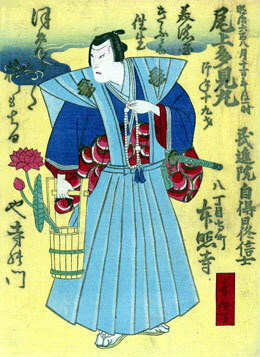 The actor Kataoka Matsunosuke III held the name of Onoe Tamimaru II from 1888 to 1901. Born in 1871. His first stage name was Arashi Ichiasa (relationship to the Arashi clan unknown). He became a disciple of Onoe Tamimaru II and received the name of Onoe Gisaburô. He took the name of Onoe Tamimaru III in 1909 and held it up to 1921. He died the 8th of May 1923. Dates of birth and death unknown. Most likely a disciple of Onoe Tamimaru III. His first stage name was Onoe Kotami and he took the name of Onoe Tamimaru IV in August 1926 in Ôsaka. He was active in Kamigata koshibai up to 1944.